LinkedIn truly has a lot to offer in the professional world, especially on the personal level, but have you really considered the possibilities for your company on LinkedIn? Often times, companies ignore (or forget) LinkedIn as a social tool, because it doesn't have the virility like Facebook, Twitter and Pinterest do. But for B2B companies, LinkedIn is the perfect social platform, and it has a lot to offer. In this post, you will learn ways in which you can maximize your use of LinkedIn for your company. We're going to walk you through the different facets of a LinkedIn company page and hope to show you how you can take advantage of this platform by promoting your company to millions of people across the globe. Discover how you can maximize the use in each of the categories below. People are highly visual, and are looking for as much information as they can get in as little time as possible. Take advantage of the vastly visual setup that LinkedIn offers, and have photos and graphics that display a lot of information about your company. Typically, the profile picture would be your company logo or name. However, you get a little more leeway with your cover photo. Check out IBM’s cover photo where they’ve displayed a journal with their slogan, “Think.” The imagery they provide gives a professional and interesting feel that really draws the viewer in to read more. As simple and straightforward as it seems, the about section on yourLinkedIn company page is really important. Including the targeted keywords that are relevant to your industry and target audience, as well as providing detailed information about your company, will help your page show up in searches. Finding the balance of what is enough and not too much will depend on your company, but typically around 200 words will cover the bases adequately while providing enough meaningful information. The largest portion of your company’s home page is devoted to recent updates. There’s nothing worse than going onto a page and finding the most recent update from three months ago. Staying current and making interesting and relevant posts will go a long way in attracting and keeping viewers on your page. While looking at your page, viewers can see how they are connected to your company. They will see the degree to which they are connected to your employees, and how they relate to your company. To maximize your efforts in creating connections, encourage your employees to make personal profiles, and link their information with your company. This will likely draw their personal connections to your company page, and will ultimately increase your number of followers. LinkedIn company pages offer a section for products and services, allowing you to share more information with your viewers. Typically, this is where you’ll really tie in your calls-to-action and connect viewers with what you’re offering. If you take a look at our LinkedIn page, you’ll see that you can add multiple products/services, and can include a good amount of detail for each. Again, a space for a cover photo is provided, so you’re given the opportunity to have an even greater impact with a visual callout for your offerings as well. To really draw in new viewers, and provide more information to professionals in specific areas, there is an option to create ads that are featured on the side bars of LinkedIn’s interface. 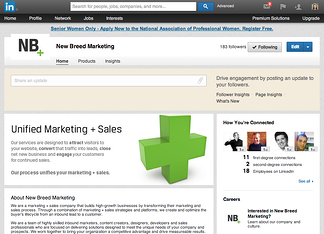 Through the use of advertisements, you can make a conscious effort to reach more leads within the LinkedIn community. Your advertisements will be featured within other company pages that may be similar to your own, increasing the chances of being found by your target audience. As the sponsor of the Vermont HubSpot User Group, New Breed created a group on LinkedIn that encourages discussion and connection amongst Vermont users. This group is featured on the side bar of our company page, and is available for viewers to browse. If appropriate, create groups connected with your company, which will be featured on your page for an increase in content and social interaction. More and more companies are turning to LinkedIn to post and promote available job positions within their company because they realize that LinkedIn is the hub for professionals around the world. By posting on such a popular platform, companies are gaining better coverage, and are finding more qualified candidates for available positions. Though an additional charge is required in order to hold a career page, it is something that you may consider, especially if your company hires on a continual basis. Check out Green Mountain Coffee Roaster’s career page. They have a video where potential candidates can get an in-depth feel of the company culture, and have used the highly organized career format to post several jobs. Unlike using a traditional job-posting site, LinkedIn offers a variety of tools and creates a one-stop-shop for potential candidates. Just by looking at the careers page, users can find what jobs are available, see what type of employees currently work with the company, get a better feel for the company atmosphere, get up-to-date information and articles on the company, and have a simple way to connect and share their digital resume. The cost is well-worth the time-saving benefits. The last, and arguably the most important resource included with LinkedIn company pages, is the insights tool. What’s interesting about LinkedIn insights compared with other social media outlets, is that LinkedIn offers some insights to the public. For example, while looking at another company’s page you can find employees at the company with new titles, former employees of the company, the top skills and expertise of employees, the most recommended employees, and companies that are similar in nature. Again, this creates an atmosphere where followers can really get to know your company and obtain a lot of information from one place. Take this information and gear your posts and information to the followers that are looking at your page, or create a different plan if you’re trying to reach another demographic. Additionally, by connecting additional tools such as HubSpot to your account, you will also be able to gain information like social media coverage. From all of this, we can find the sources that are driving traffic to your site and continue to leverage and develop content in those areas. Figure out ways in which you can boost or eliminate sources that are not driving as much traffic. Adding this invaluable information to your repertoire will greatly increase company and follower understanding, and there’s really nothing to lose in starting a page. There are so many possibilities with a company LinkedIn page that we couldn’t possibly begin to cover them all. Our most general advice is to play around with your page and see all that LinkedIn has to offer.